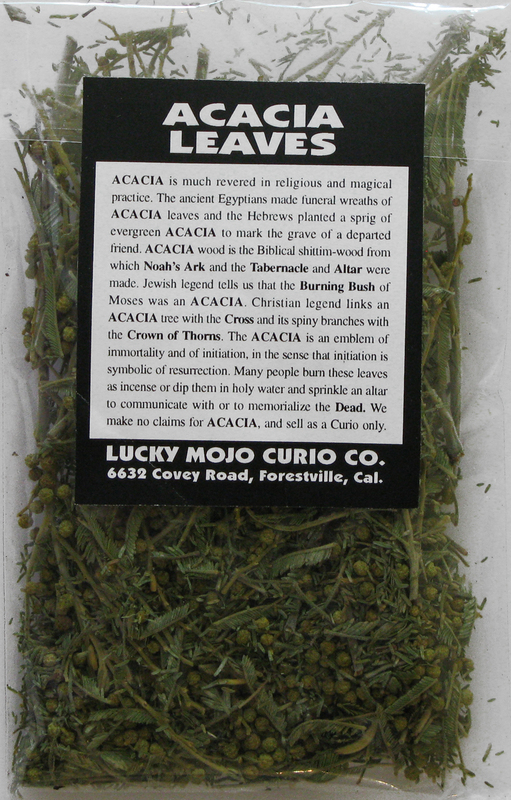 ACACIA is much revered in religious and magical practice. 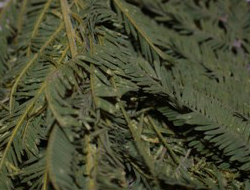 The ancient Egyptians made funeral wreaths of ACACIA leaves and the Hebrews planted a sprig of evergreen ACACIA to mark the grave of a departed friend. ACACIA wood is the Biblical shittim-wood from which Noah's Ark and the Tabernacle and Altar were made. 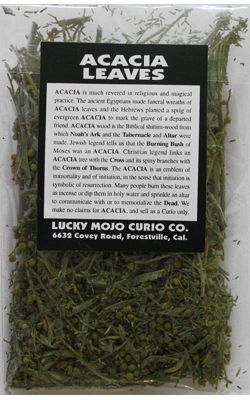 Jewish legend tells us that the Burning Bush of Moses was an ACACIA. Christian legend links an ACACIA tree with the Cross and its spiny branches with the Crown of Thorns . The ACACIA is an emblem of immortality and of initiation, in the sense that initiation is symbolic of resurrection. Many people burn these leaves as incense or dip them in holy water and sprinkle an altar to communicate with or to memorialize the Dead. We make no claims for ACACIA, and sell as a Curio only. Many more folkloric magical spells utilizing ACACIA LEAF can be found in the book "Hoodoo Herb and Root Magic" by catherine yronwode.